"The bed and pillows were comfortable and we slept well." 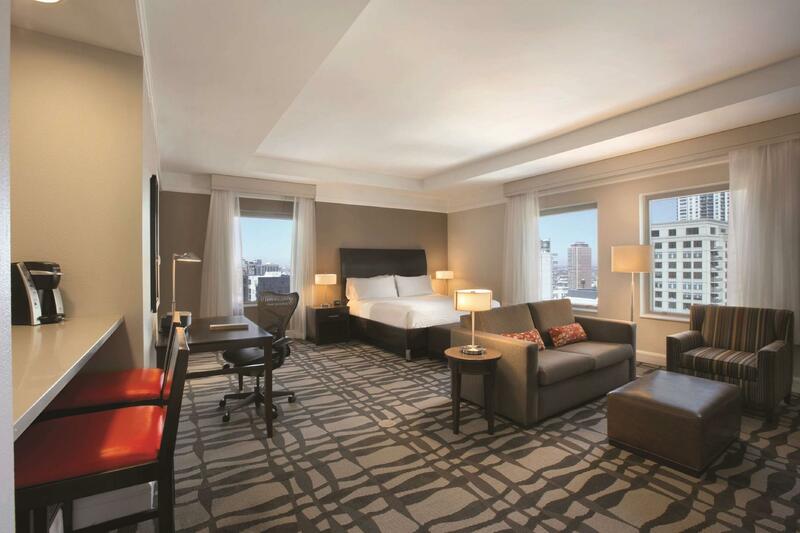 Have a question for Hilton Garden Inn Chicago Downtown Magnificent Mile? "Yundi (housekeeping staff) has done a great job assisting our needs!" "The room was clean and comfortable." "The bed is comfortable, clean n big size." 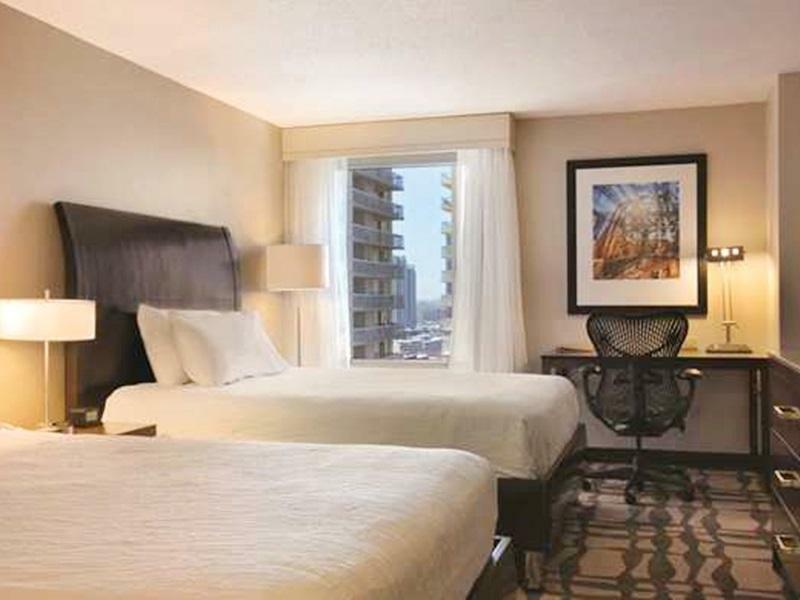 Hilton Garden Inn Chicago Downtown Magnificent Mile is a beautiful, modern hotel located in the very heart of the windy city. The hotel is made up of 23 stories and has 357 cozy and well-maintained rooms. 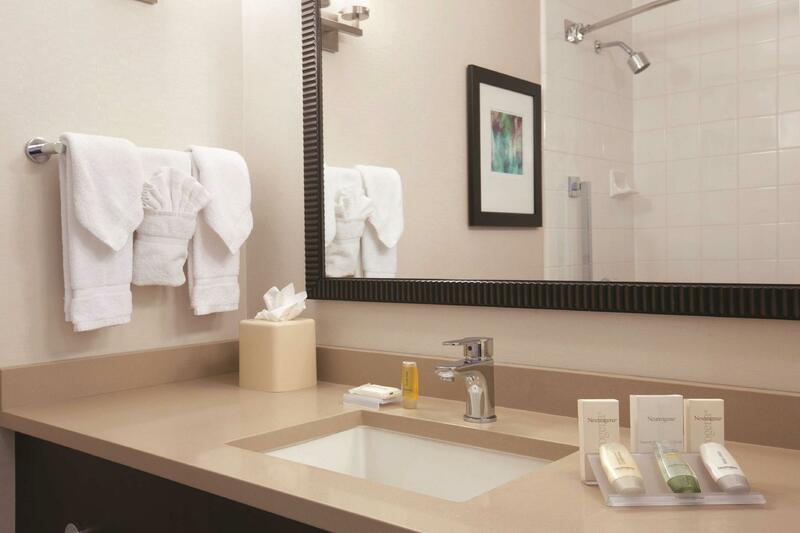 Each room is equipped with modern amenities, including workstations and cable TV. The hotel sits close to a lot of the city's business and shopping centers and is also home to a great on-site bar and restaurant. Business and non-business travelers may also avail of the hotel’s business center. Guests can also enjoy the hotel’s indoor pool as well as the fitness facility. "The staff were very helpful and friendly." had the most pleasant stay at the hotel, the room was very comfortable and the free wifi is stable and much appreciated. customer servicing was excellent, the front desk was truly helpful and extremely friendly. great restaurants only a short walk away and the shopping was great. The bed linens seemed old and wore out. The bed and pillows were comfortable and we slept well. No vent in the bathroom was a bit of a problem and the pool was small for the amount of people wanting to use it. 27 people when I was there. I absolutely loved my stay at the Hilton Garden Inn! The staff is extremely friendly and willing to accommodate your every need. Extremely clean, wonderful breakfast at Weber grill, and the pool was nice. The location is perfect. Close to Hubbard street, Michigan Ave, and the L, so it was extremely easy to navigate to and from areas around the city. Recommendations from the staff for pizza and the hot spots of the city were welcomed and even discount coupons were given as well. I will never stay at another establishment.m ever again. I will be visiting again soon under my business and I’m already looking froward to it! It was a comfortable 7 nights stay at this hotel, great beds, great pillows, great bathroom, it has coffee machines, microwave, and refrigerator! Great hotel!! Having a great stay at this hotel during 2017 Chicago Marathon. The route went pass this hotel, so my family could wait and cheer just in front of the hotel. Wish breakfast was included, but other than that, great hotel! Staff so welcoming and helpful. Parking is $48 a day, but a girl at the front desk helped me find cheaper parking! Really close to shopping (Magnificent Mile) and groceries if you want to buy your own breakfast. Really clean! Customer service, clean hotel room, wifi service, wifi service. I loved the customer service, friendly stuff and polite. Hotel room was very clean and had everything I needed from body lotion to hair conditioner. A lot of clean towels from microwave to refrigerator. Excellent location and views. Definite I will book again in the future. I love this place!! There were some issues with the plumbing. One that sticks out was when our shower faucet got stuck and we almost flooded our bathroom. The plumber came in with his work boots and mudded the bathroom but didn't bother calling for housekeeping. Leaving us to clean it up ourselves. Theres also a restaurant downstairs that served the worst food. Absolutely bland, but at least the hotel is well located right above the red line so it was easy to escape the shortcomings of the hotel. Probably wont come back. Great! The value for the money was excellent. Even though the room was big and comfortable enough for my tastes, the staff also sent me a fresh fruit package and a free Starbucks gift card to top it off. Awesome experience! Good quality hotel in a strategic location. Reasonable room size with comfortable king size bed. Good view out of the room as I stayed on the 18th floor facing north. Fast complimentary internet. But the plumbing could be a bit noisy. Will definitely stay in this hotel again if I do go to Chicago in the future. Clean, location and excellent adjoining restaurant. Considering I was not booked into the hotel when I had paid up front with Agoda, I was most impressed with the front desk in sorting problem quickly ( just as well they were not full.) 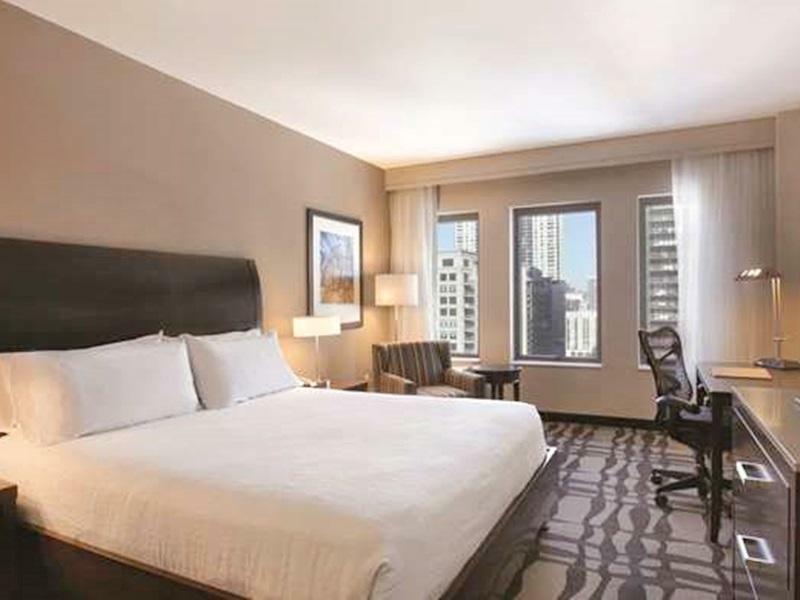 However hotel was great, in an ideal location very short walk to magnificent mile, clean room and really pleased with the whole stay, the adjoining restaurant is very good and do a breakfast that is the best we found across 4 states we visited. I had my trip with my wife and my 3 year old daughter. The staff were very active; things were done without the need to ask for. We booked for a room with 2 queen beds. The room and beds were very clean and spacious. However the rubbish bin were not cleared daily, but its not really an issue for us. Overall a great and pleasant stay. Very close to many to-do items in Chicago. Few minute walking distance to everything including restaurants, grocery stores, boat tours, etc. Nice clean rooms as expected in Hilton Garden Inn franchise hotel. Very expensive parking so do not bring a car here. when i booked the hotel through agoda, i thought hotel is located in the isolated area since nearby buildings were not shown in the picture in the web site. as the it's in the downtown, i felt a little bit confused to find the hotel since surrounding is quite different from the picture. we had to use valet parking, per night. the sub way station is below the hotel. it was very convenient to go to ball park to see base ball game. nearby hotel is the entertainment area. around the corner, we can enjoy the famous chicago thick pizza. The hotel´s location is just great, within walking distance from the magnifficent mile, millenium park and even the Navy Pier!, the room's decour is a bit old fashioned, though clean and it included a frigobar and microwave in it! this proved really helpfull for eating the leftovers of the deep dish pizza leftovers the following day! close to shopping district and just accross the river from the business district. convenient parking but expensive; many restaurants within walking distance; adequate pool and work out facility; rooms were average to small , clean and up to date, free internet a supprise for chicago. rates are reasonable especially on the weekends. i would recommend this hotel. Large and clean room. Very nice staff. I had a very pleasant short stay at the Hilton Garden Inn, Chicago. The best part is that I know I wouldn't need my car to stroll around the city center. All are close to the hotel. The location is simply great! The room itself is CLEAN and Tidy! From the time I arrived and checked-in to the hotel, I had a good experience. Free Wifi at the lobby area is great too. One of the most stunning features that the hotel has, in fact this is the first time I saw this feature in a hotel, is the fact that the bed's softness and hardness can be adjusted manually! This really really helped my parents adjusting their bed preferrence. The receptionists as well as the concierge people were very helpful in giving us some of the city's insights as well as food recommendations. They even had a list of food recommendation ready for you with their own review. I am so glad for this!